The Peanut Gallery – 2015 Review. It’s that time of the year again! 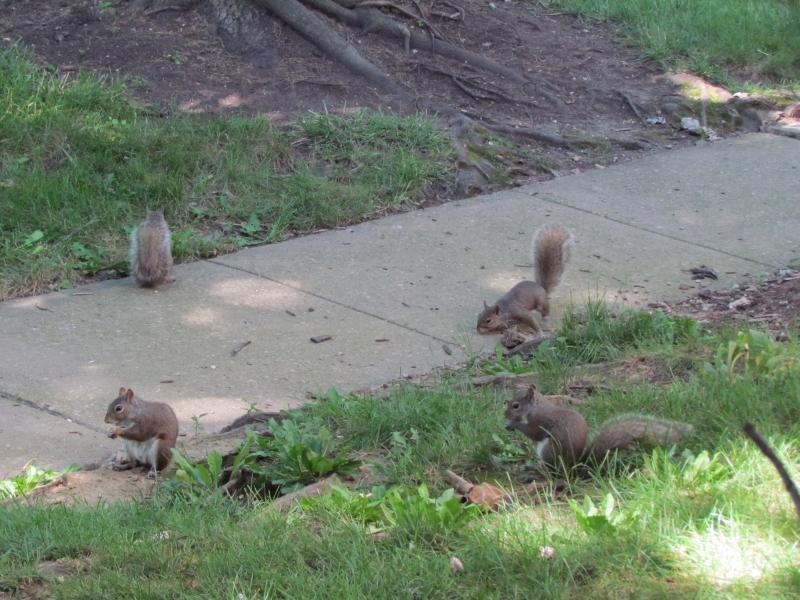 Time to look back at all of the creatures I saw outside my front door, where I put peanuts and safflower seeds out. I had a few new visitors show up this year. Previous Peanut Gallery year-in-review posts: 2014, 2013, 2012, 2011. 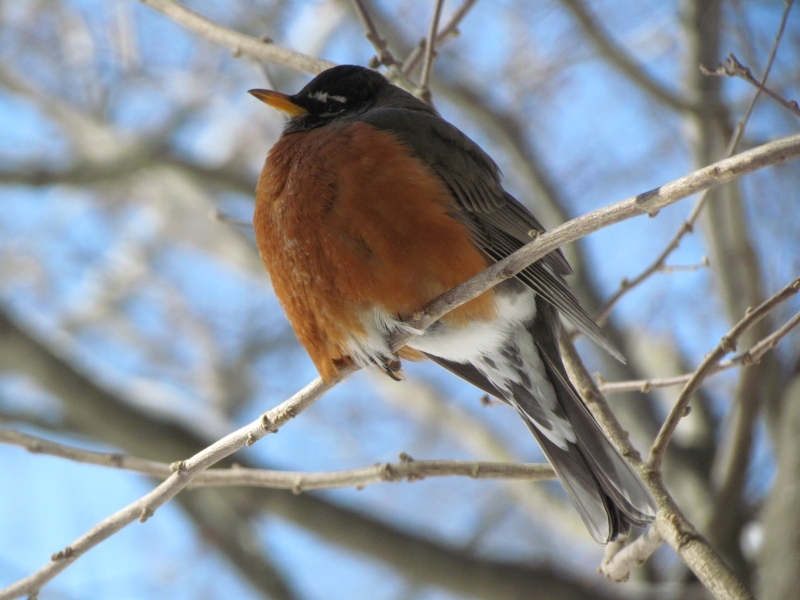 The Robins of February return! 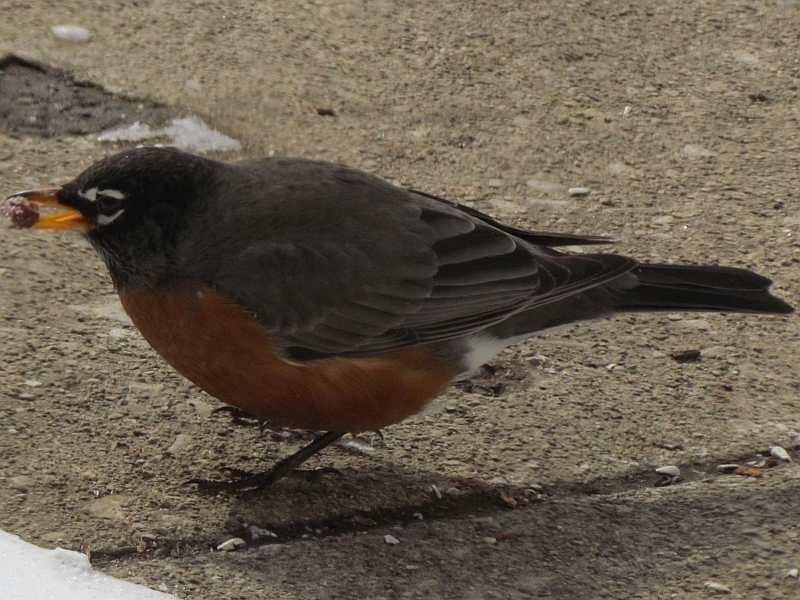 When the berries run out, I have at least one Robin that comes by for raisins in late winter. 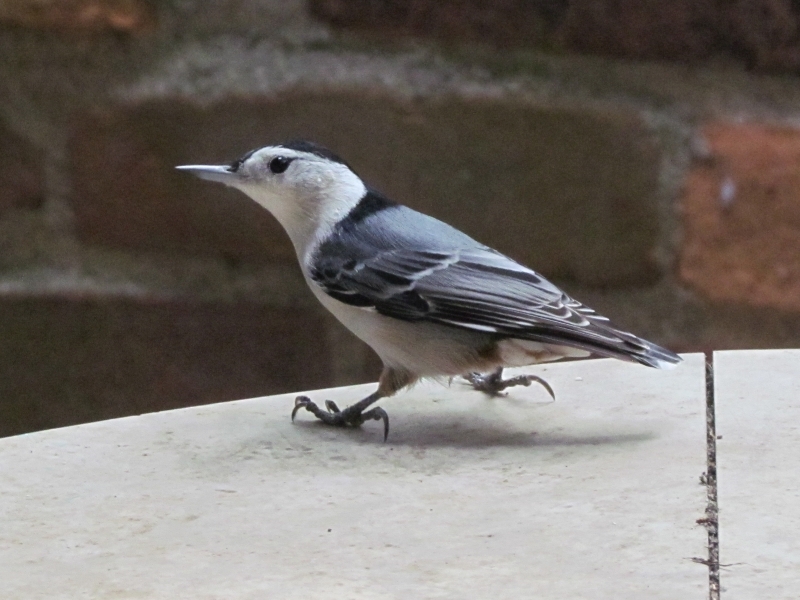 More than one, but a male likes to claim my patio as early territory before mating season. 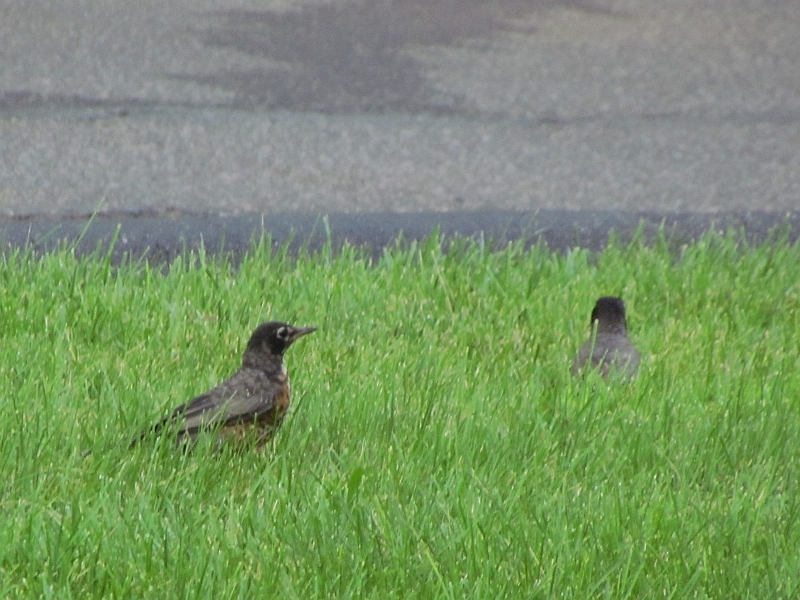 The rest of the year I’ll see Robins occasionally on the lawn out front, here is a young bird with a parent. 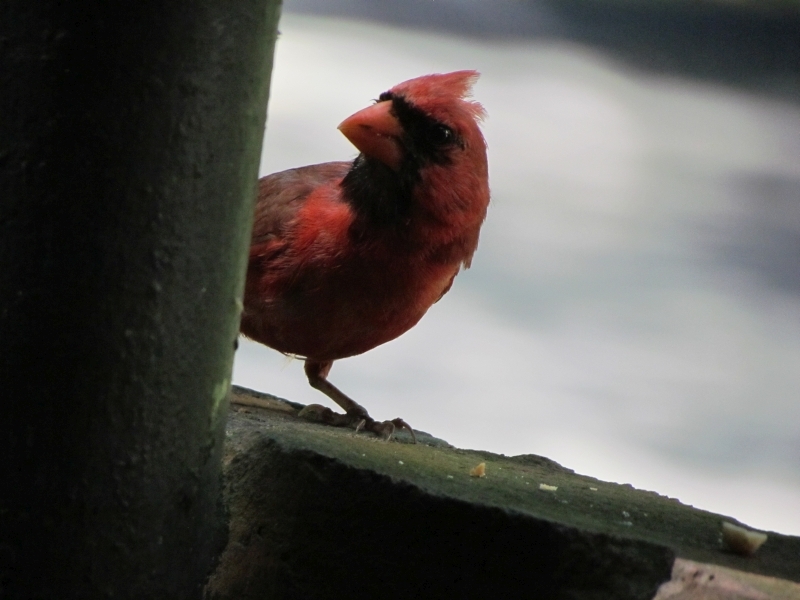 My steady pair of Cardinals were here again this year. As usual, they visit mostly first thing in the morning, and last thing at night. A second pair visited occasionally too. The 2 pairs don’t fight, but they are nervous around each other and usually the visiting pair flies off if the regular pair is here. Once this past summer, the 2 males sort of ‘faced off’. 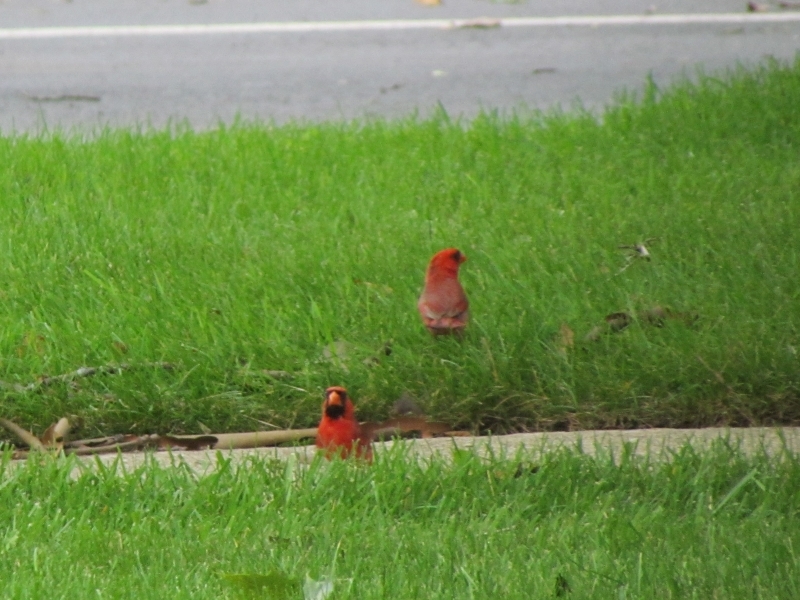 Curiously, they flew across the street and turned their backs on each other. They left after a while. It was like they were establishing boundaries. Cardinals are not aggressive birds and this kind of thing is interesting to see. 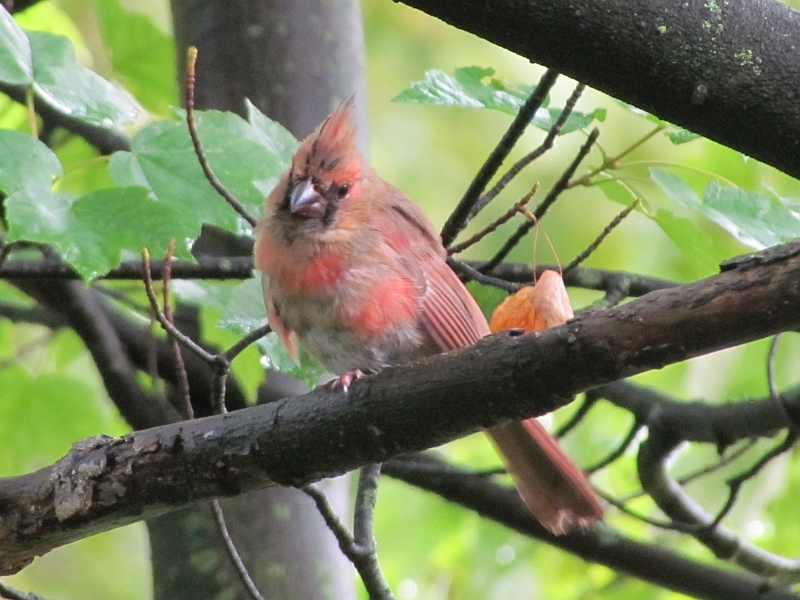 My regular Cardinal pair had 2 young this year- they can be told by their patchy colors and the dark beak (until they get older). 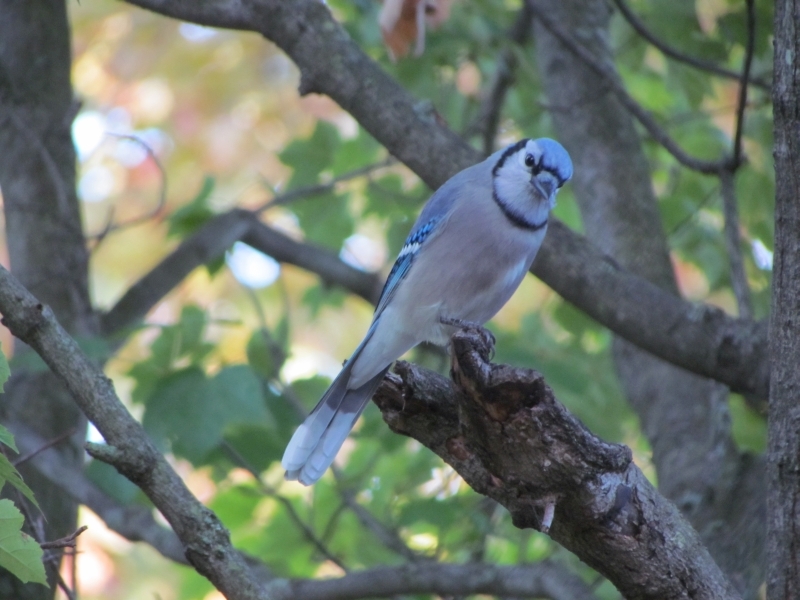 This handsome fellow would visit for peanuts for a couple months after leaving the nest. He was more skittish than his parents around me, but that’s not a bad survival trait. He’ll probably be seeking a territory and mate of his own next year. The occasional Starling came by, mainly in the spring. I didn’t have as many visiting this year for some reason. 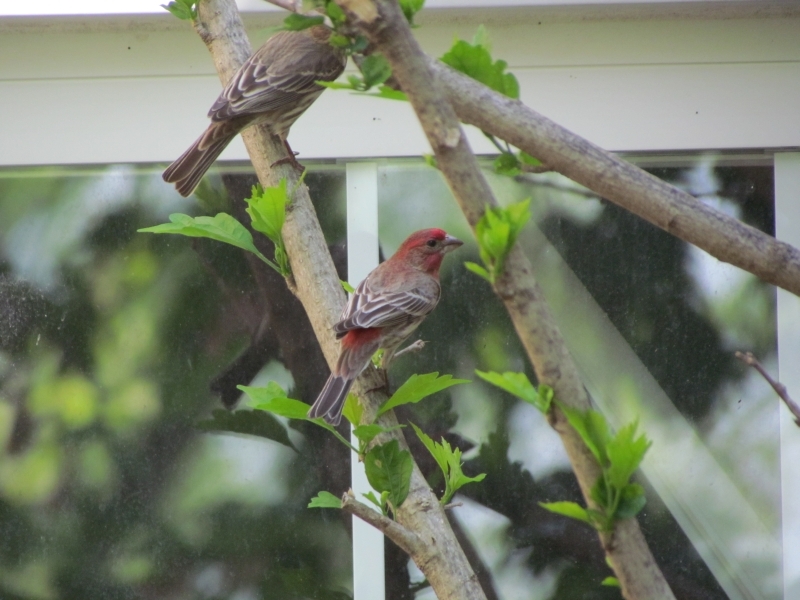 House Finches occasionally come by for safflower seeds. Not as many this year either, though I saw a good amount around the apartment complex nesting. 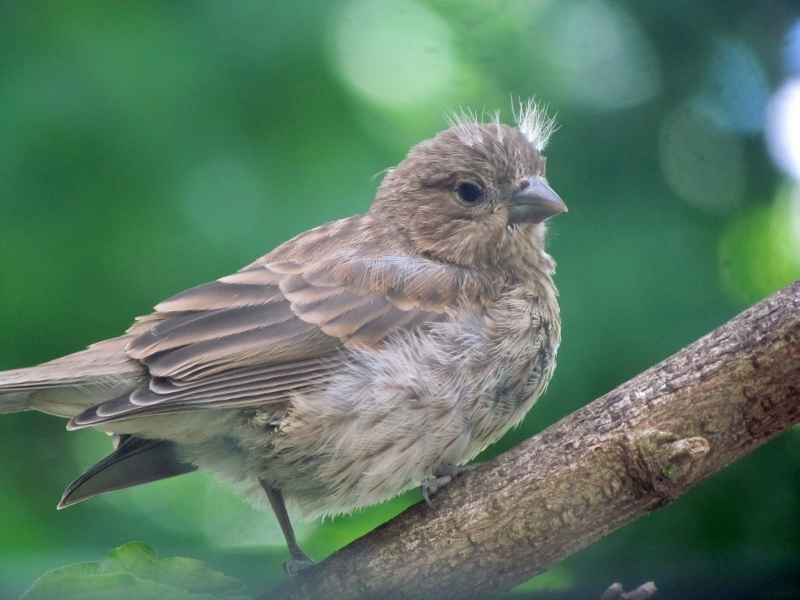 Here’s a young House Finch right outside one of my windows in the Rose of Sharon Bush. He or she is waiting to be fed by a parent, who will teach this young one to fend for itself. I like the little tufts of feathers on the head. 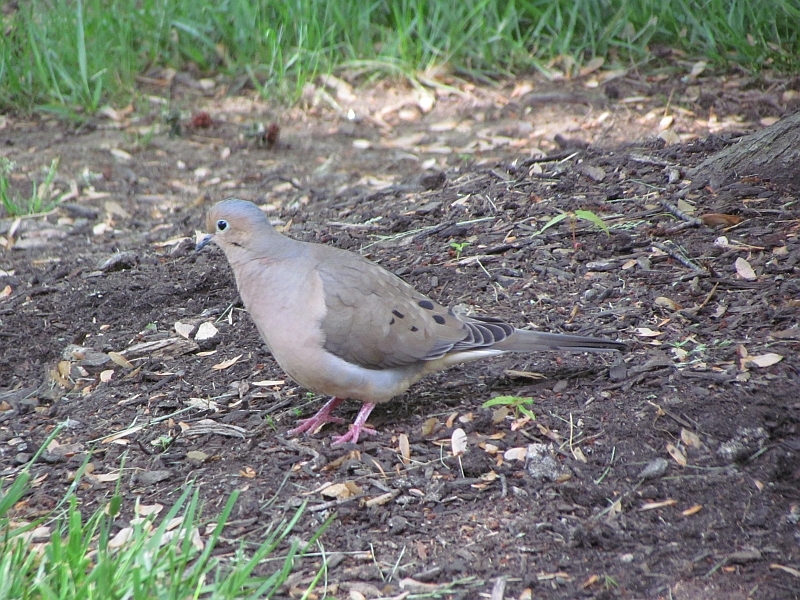 Mourning Doves love safflower seeds scattered upon the ground. I’ve had up to 5 at one time hanging out pecking at seeds. 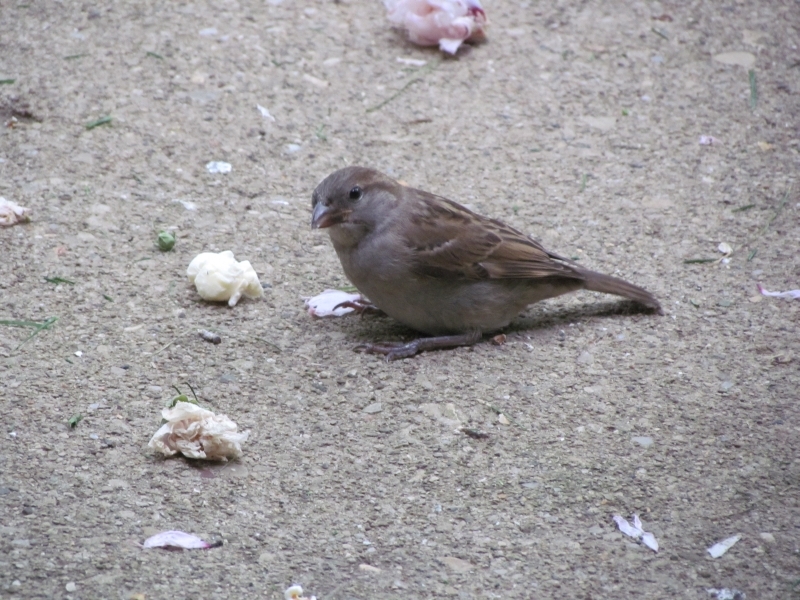 They are more skittish than some of my regular birds, but they slowly adapt to me opening the door and tossing out a fistful of their favorite seeds. 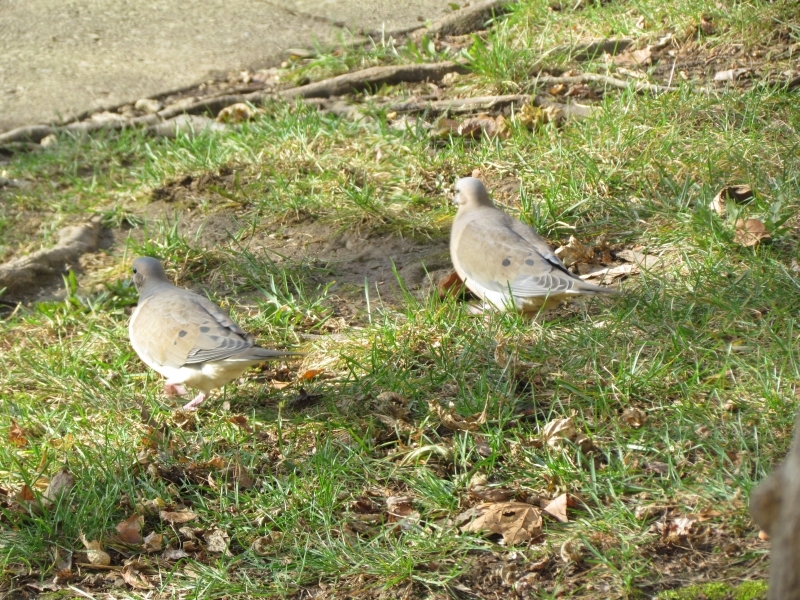 Here’s a pair walking away from me as I toss some seeds out- they aren’t flying off when I open the door- progress! 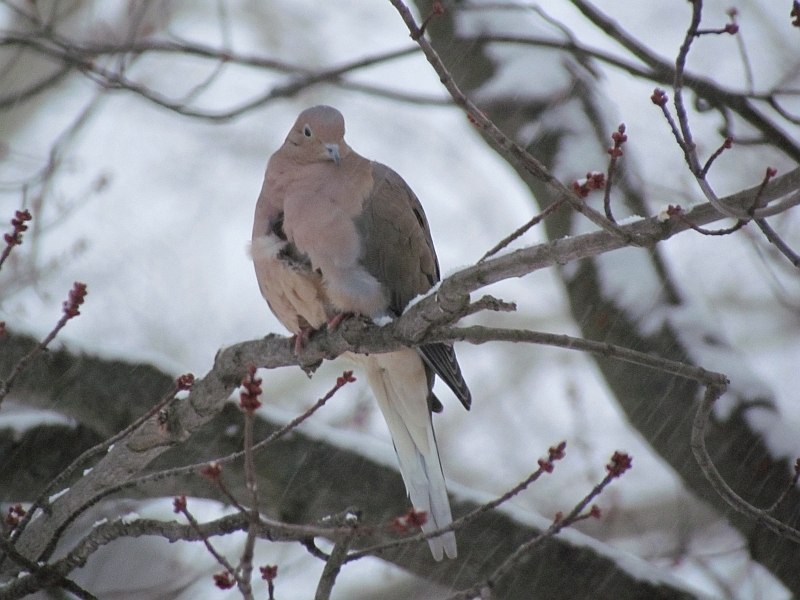 Here’s a Dove that looks like it had a close encounter with a hawk! 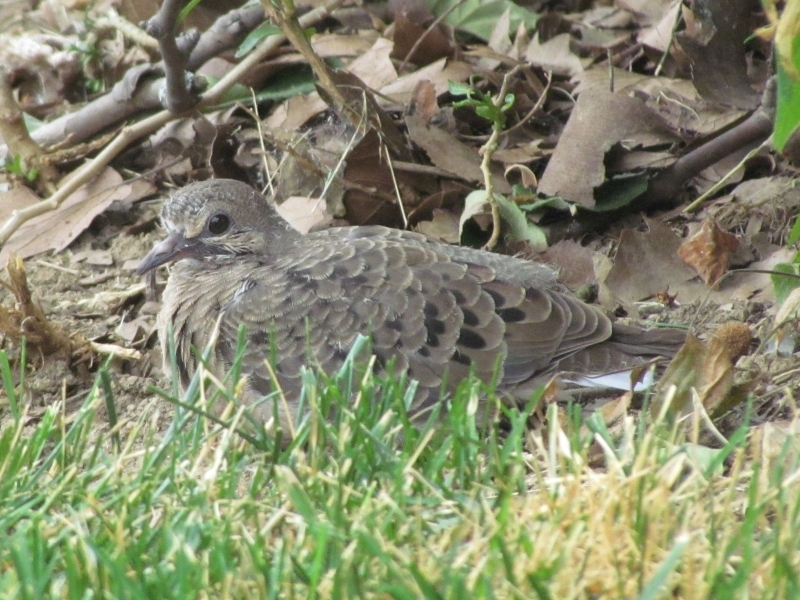 And here’s a young Mourning Dove on the apartment complex, holding still and blending into the scenery this summer. Handsome birds. 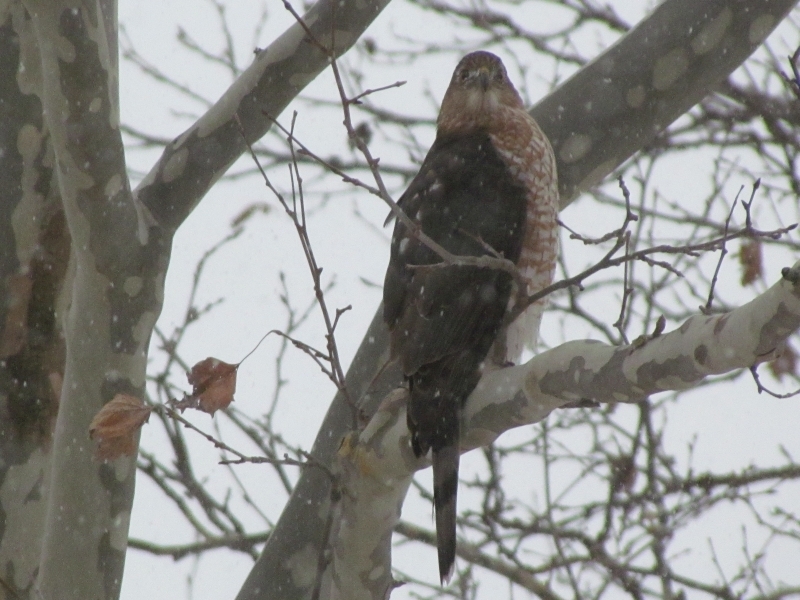 Speaking of Hawks- here’s my resident Cooper’s Hawk perched on a tree across the street. This is an adult, as told by the red bars on the breast. 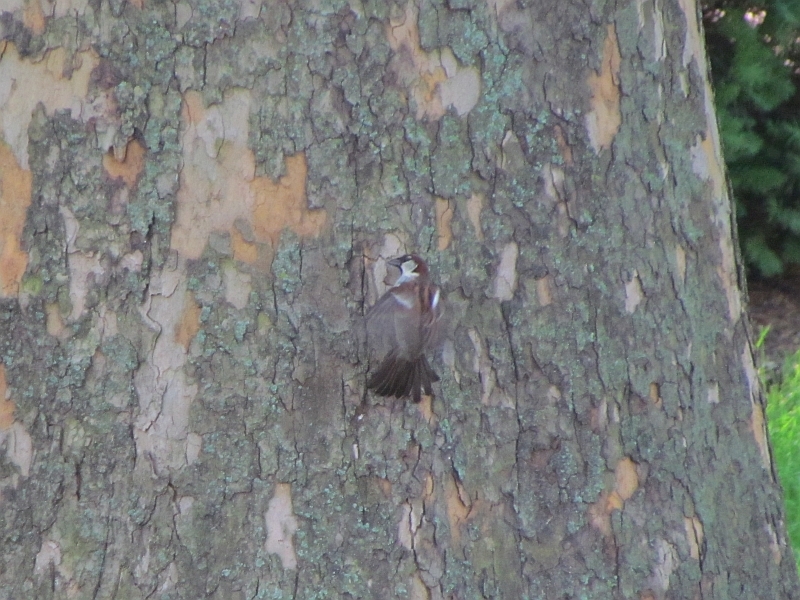 Here’s an immature Cooper’s- told by the brown streaks on the breast- eating a bird it found last winter on the complex. This is probably the offspring of the adult pictured above it. These birds are amazingly agile and stealthy. You can often tell when they are around by the alarm calls other birds make. 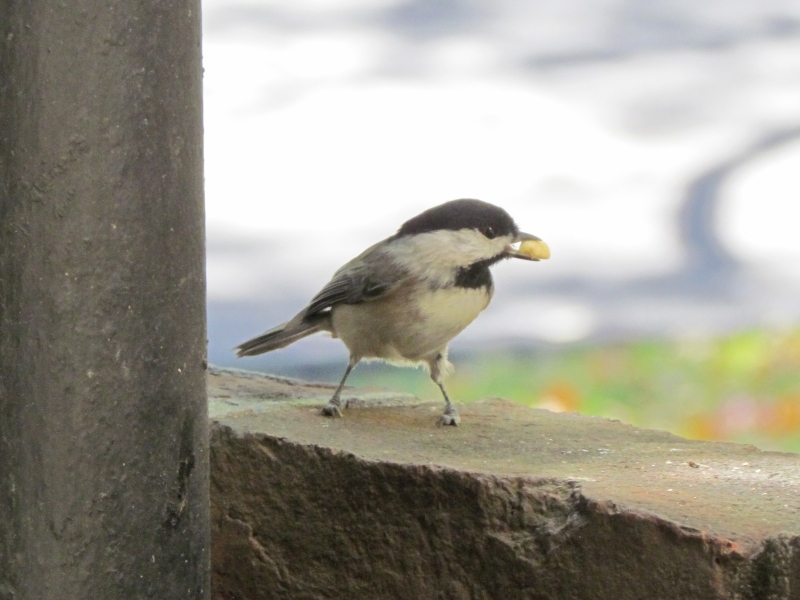 Carolina Chickadees are frequent visitors- I’ve had from 1 to 3 birds show up at once. 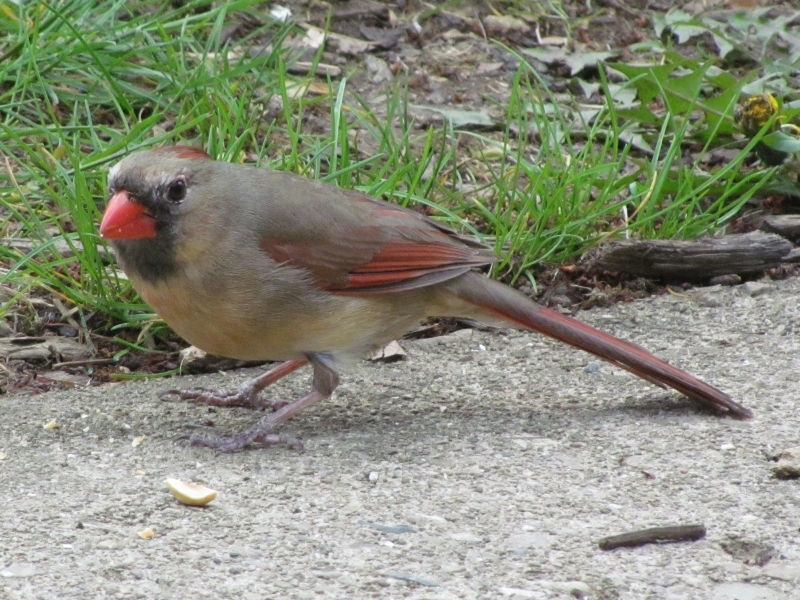 They are used to me feeding them, though they’ll chatter at me if I’m too close to their peanut supply. 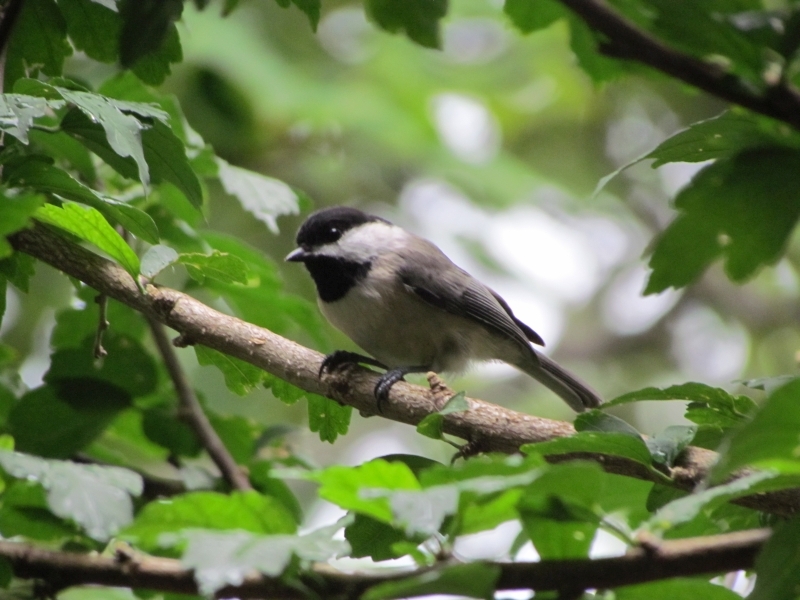 Here’s a juvenile Chickadee across the street last summer. Its parents brought him around. I was a bit concerned for the little bird so I walked across the street and shooed it into the bushes along an apartment building- much safer there! The parents raised heck but it all worked out well. 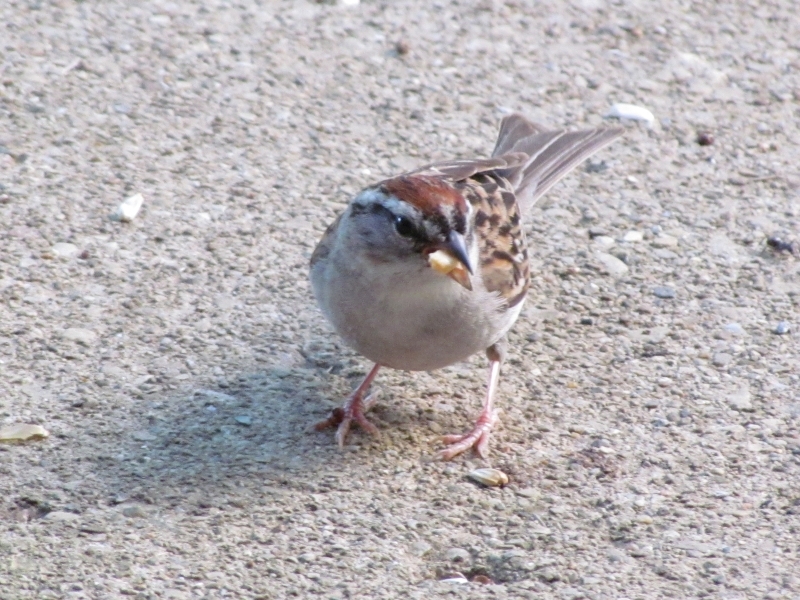 Chipping Sparrows visited in the spring and summer. These tame and gentle birds are fun to feed. 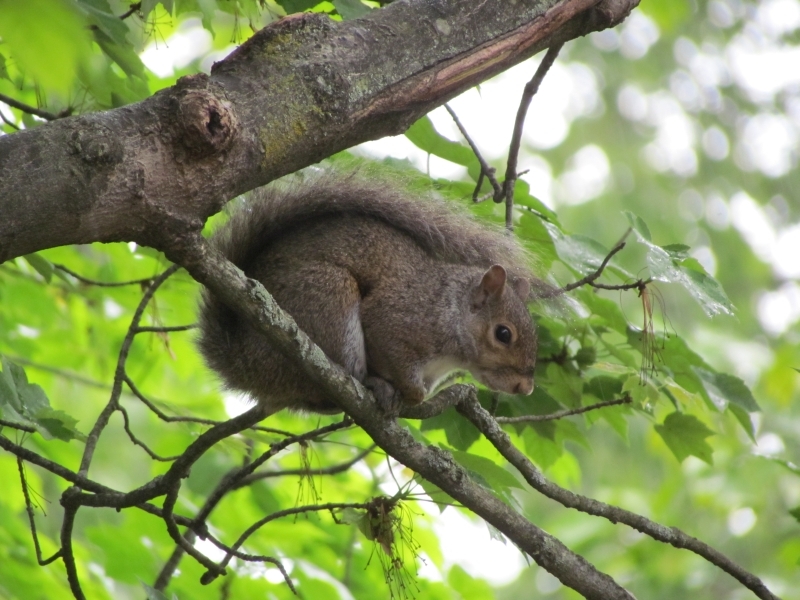 Occasionally one would spiral right out of a nearby tree and plop down a few feet away from me, hoping for peanuts. 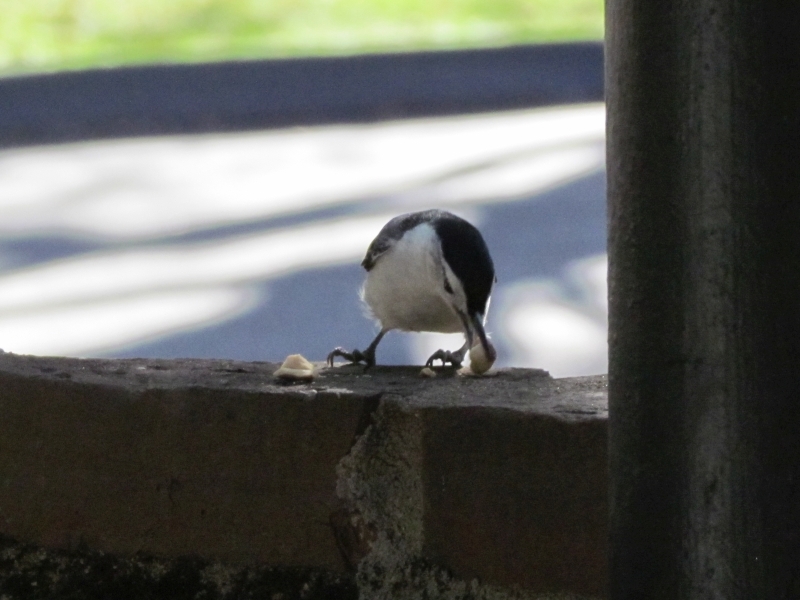 I crumble peanuts up for them since their beaks aren’t as robust for chopping them up. They disappear into flocks in September and migrate south in October. 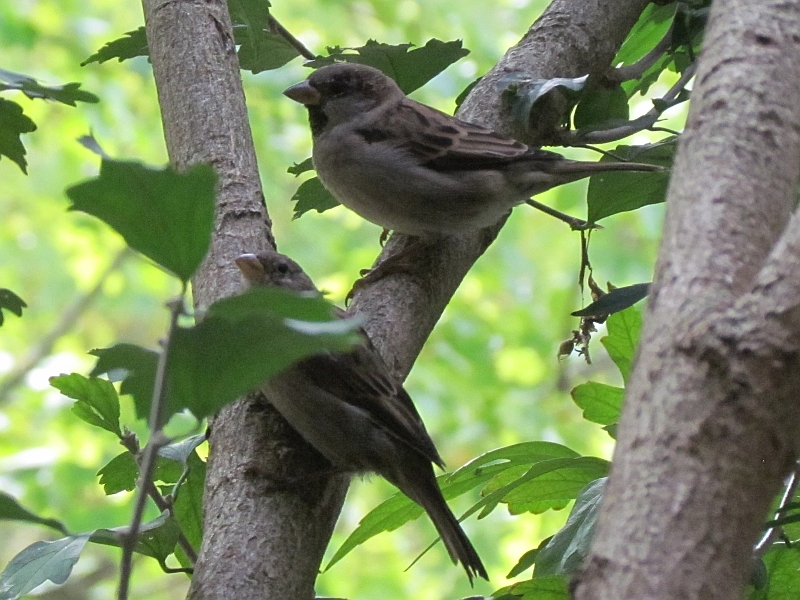 House Sparrows come around to eat occasionally- there’s a flock of a dozen or so that hangs out across the street in the bushes, where Hawks have a hard time getting them. This fellow shows how they can hover and inspect places for insects when they wish. I call this female Little Girl. She’s tamer than the other House Sparrows, and will often land upon my patio wall waiting for a donated food item when I open my door. Here’s a mother feeding a young male juvenile. 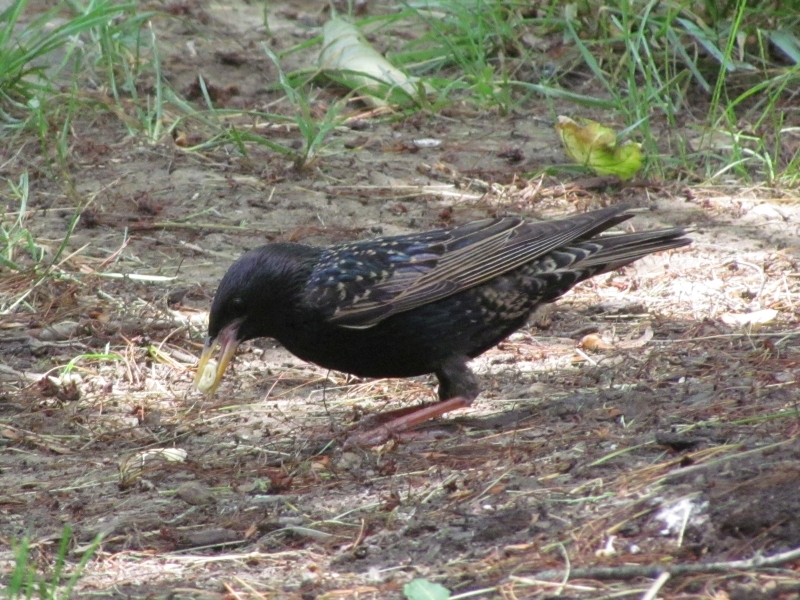 Here is the male with the deformed beak. I see him less often but he is still around. 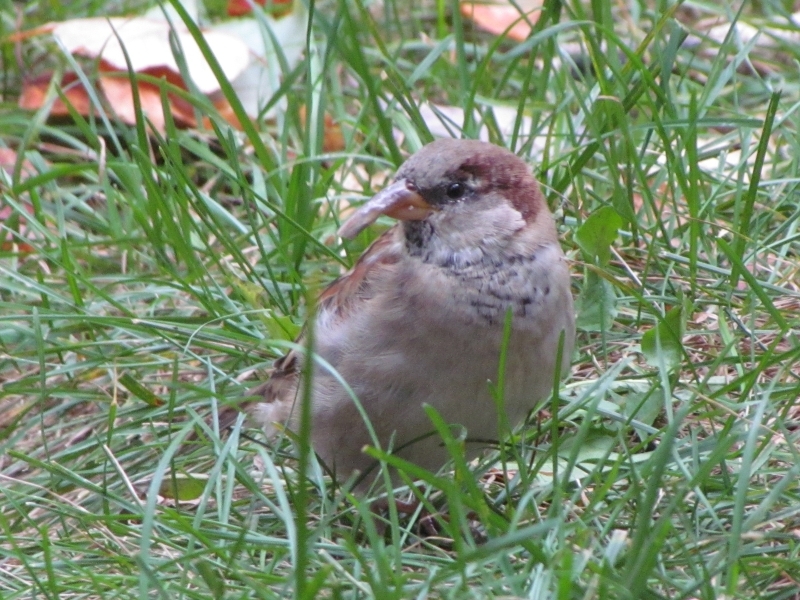 Recently I thought I saw him with a shorter beak, like the long part had perhaps broken off. I hope that is the case! 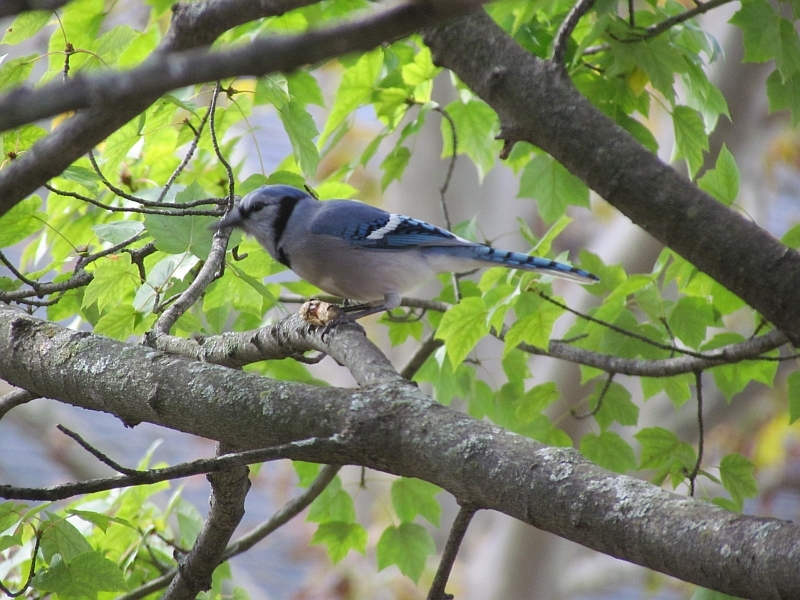 Blue Jays come by and make all sorts of racket until I throw them some peanuts. They seem to show up mostly in the autumn for whatever reason, usually in pairs. I’ve had 2 pairs at once competing for peanuts who will occasionally spar with each other. 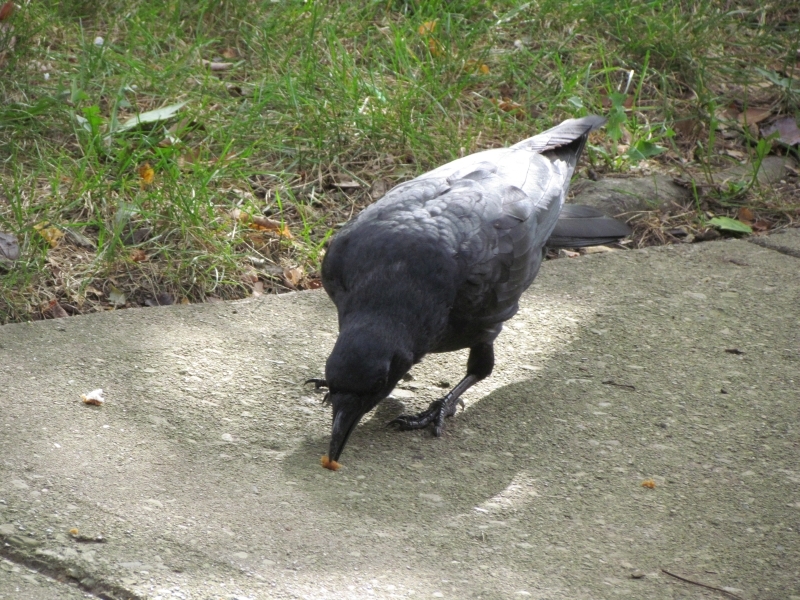 The Crow family that visits me has changed. Last year I had up to 8 visitors, including 2 young ones. Now, I will typically see anywhere from 1-5 Crows. 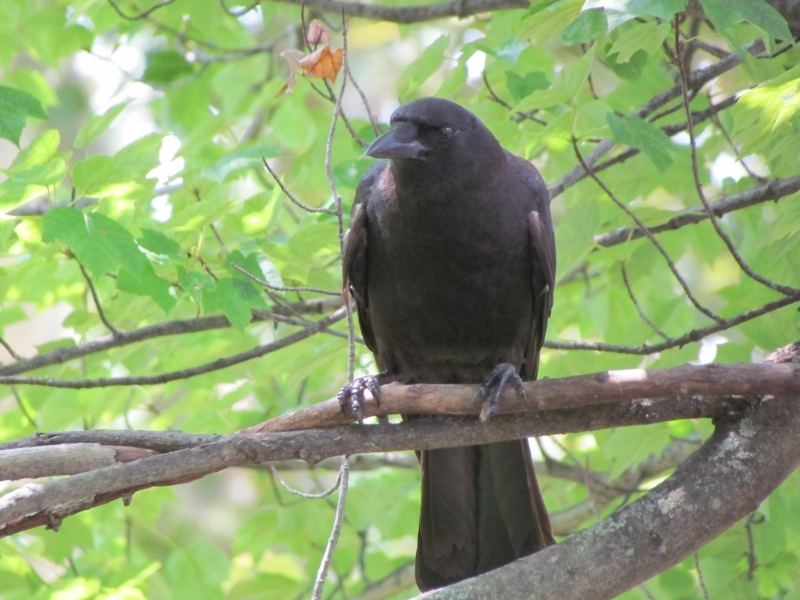 I believe a couple of the 2-year-olds who had assisted their parents in raising young have left to form their own families- that’s what Crows do 🙂 The parents didn’t seem to bring their young birds to me this year, though I saw them a couple blocks away with 3 young birds they were feeding this past summer. They have apparently adopted a slightly different territory and I have a portion of the old Crow family left that visits now. 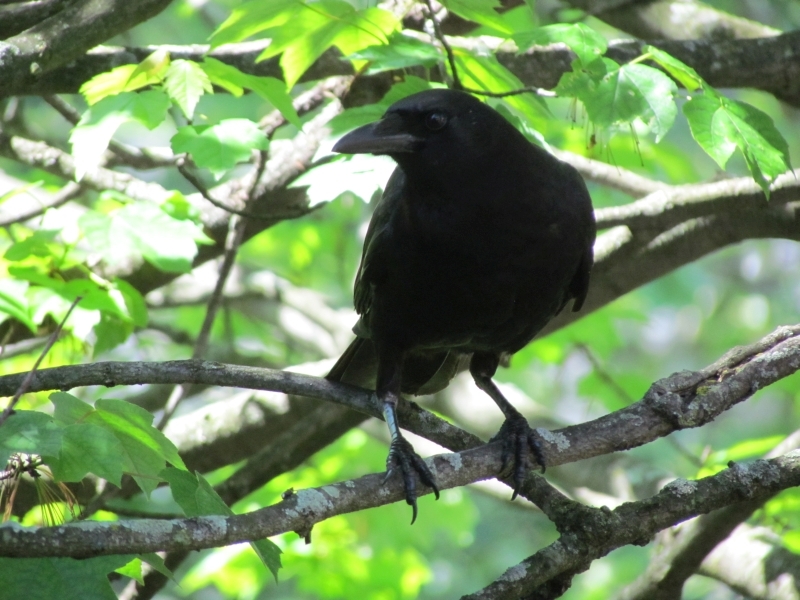 I can tell some of the Crows apart from the others by behavior and physical characteristics. 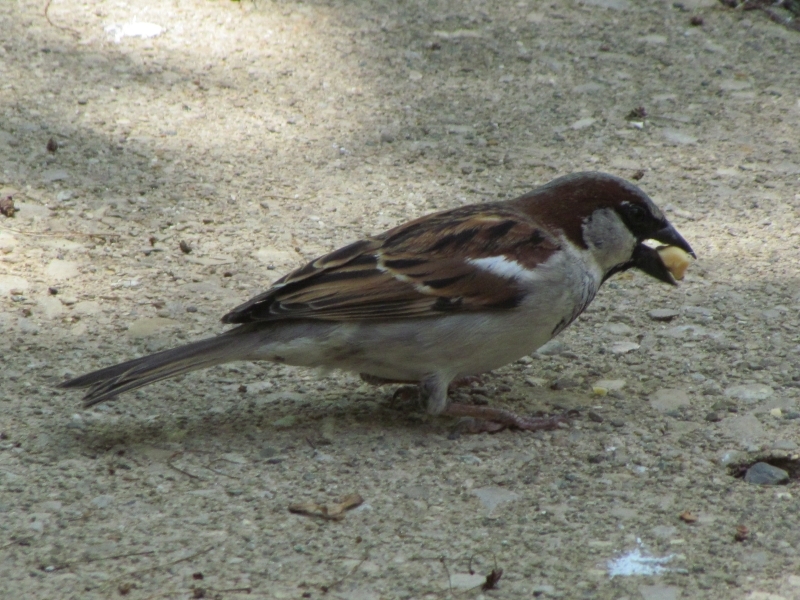 This one has a larger lores area near the beak, and loves filling up its crop with dry-roasted peanuts. There is one I call Flinchy because they flinch when picking up food (like something bad happened once when they picked up something). There is another Crow that imitates that behavior in the family. 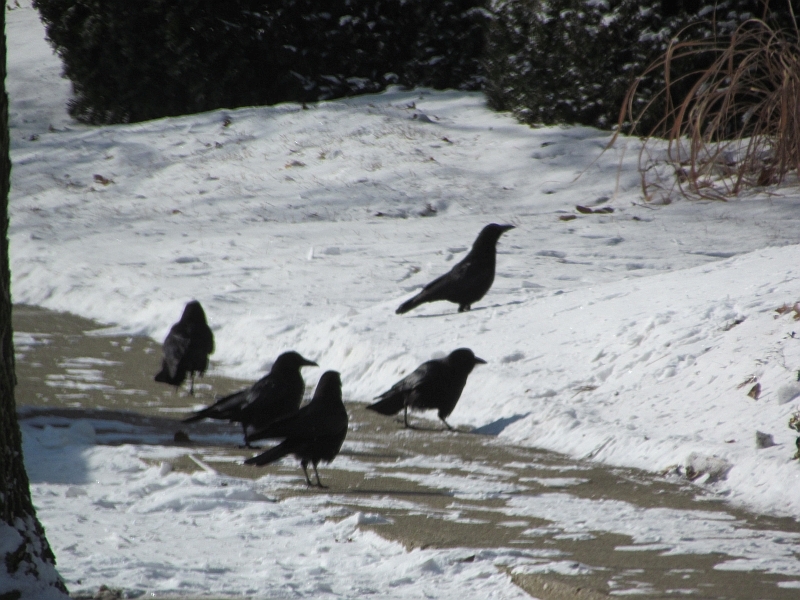 Here’s all 5 of the Crows interested in something nearby- I figured a Hawk was about. They are fascinating birds to watch, as they are highly intelligent and have an extended family. 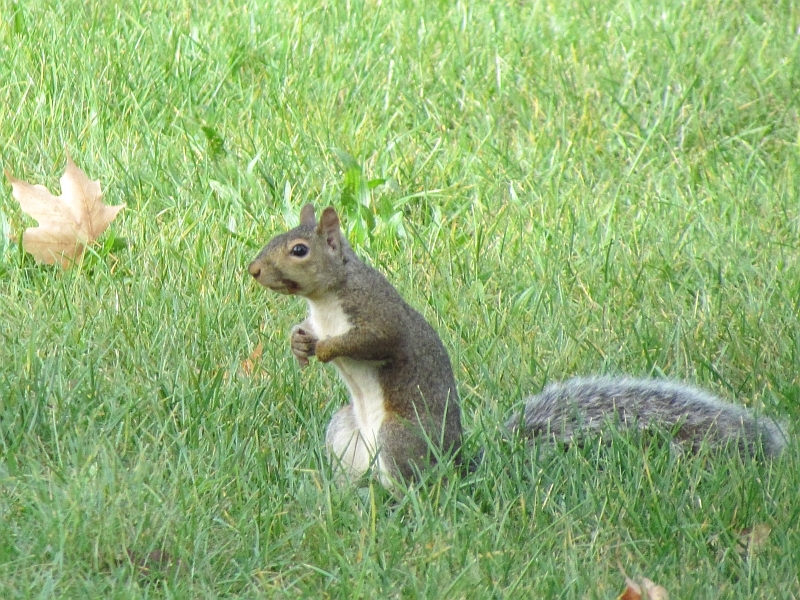 As usual, there were several Gray Squirrels about. There were different personalities in evidence, so if you pay attention you can figure out who is who. 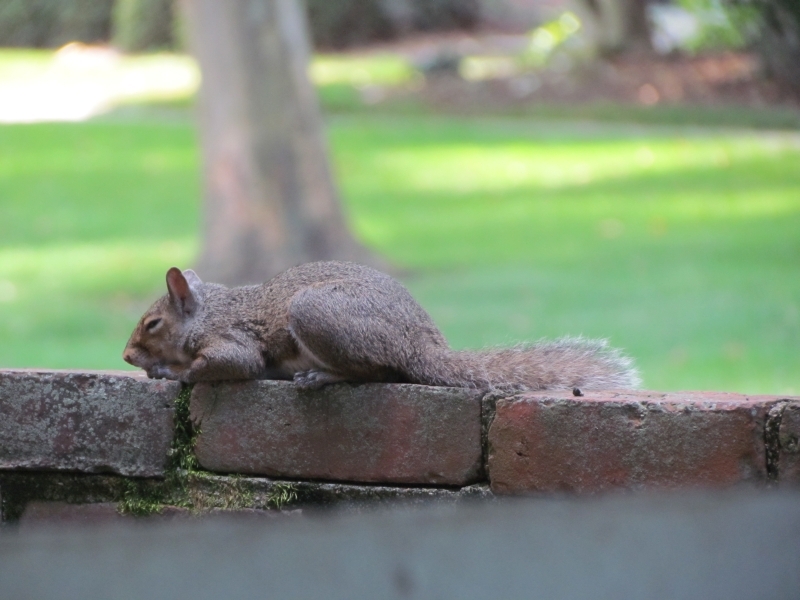 I call this one Shy Guy- he keeps his head pointed down and doesn’t come running up almost into the apartment in excitement to get peanuts, but he will come fairly close when hungry. He is not as demonstrative as the others. Different personalities! A lazy summer’s day, dreaming of peanuts. Using the built-in rain umbrella! 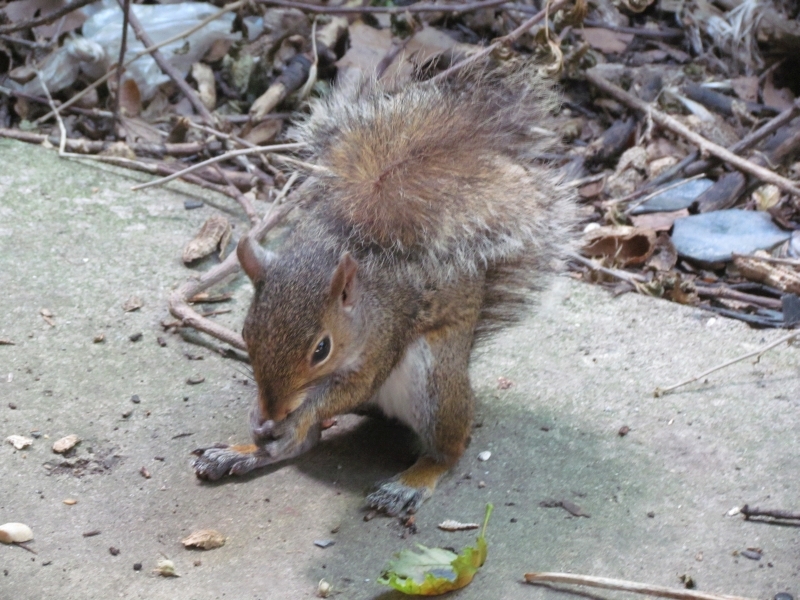 Here’s a younger squirrel from a late litter this year. 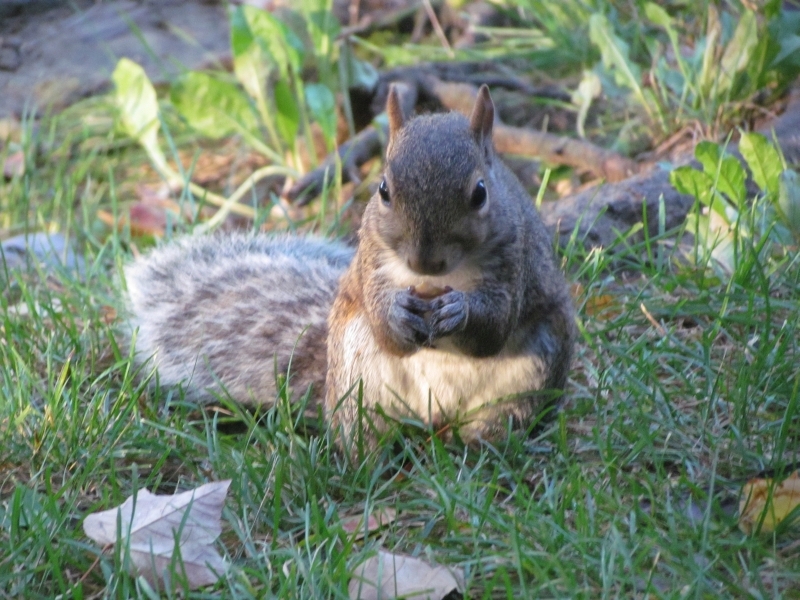 I’ve noticed a few rather blunt-nosed ‘no-neck’ squirrels this year, probably from the same litter. Some older squirrels will be around year after year, joined by new younger ones. It seems that they spread out across the area gradually. 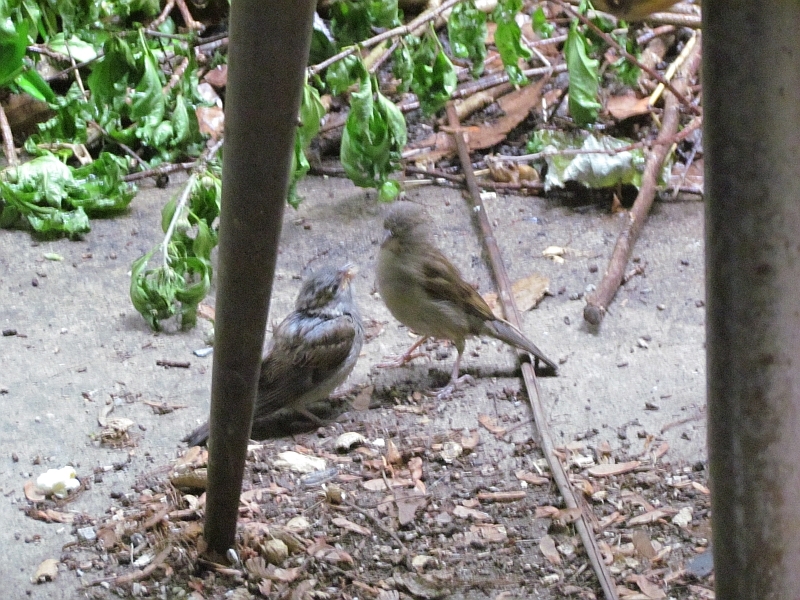 And now, some rarer visitors and some new birds. 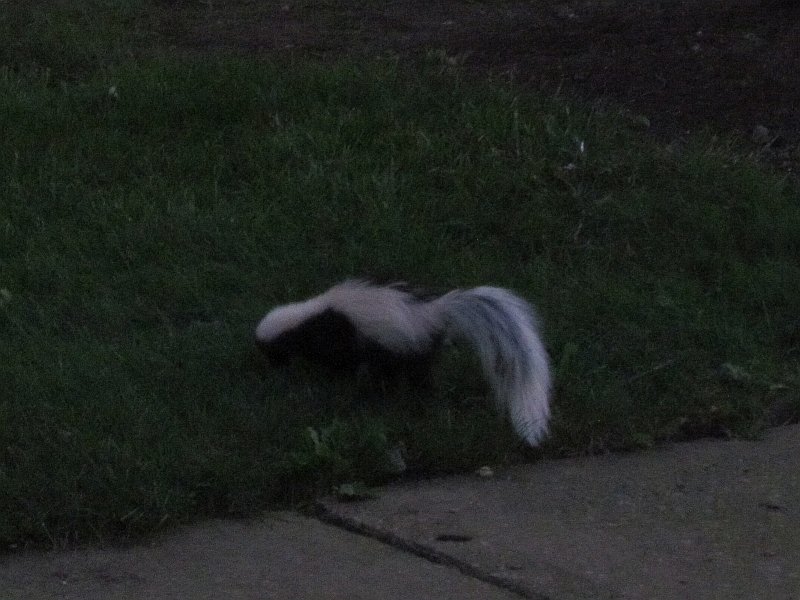 Here’s a Skunk that came by looking for a stray peanut at night. Beautiful creature. Unfortunately this past summer, the Skunk was found laying upon the grass in the daylight- a bad sign- and after taking it to the Ohio Wildlife Center, had to be put down due to neurological issues. 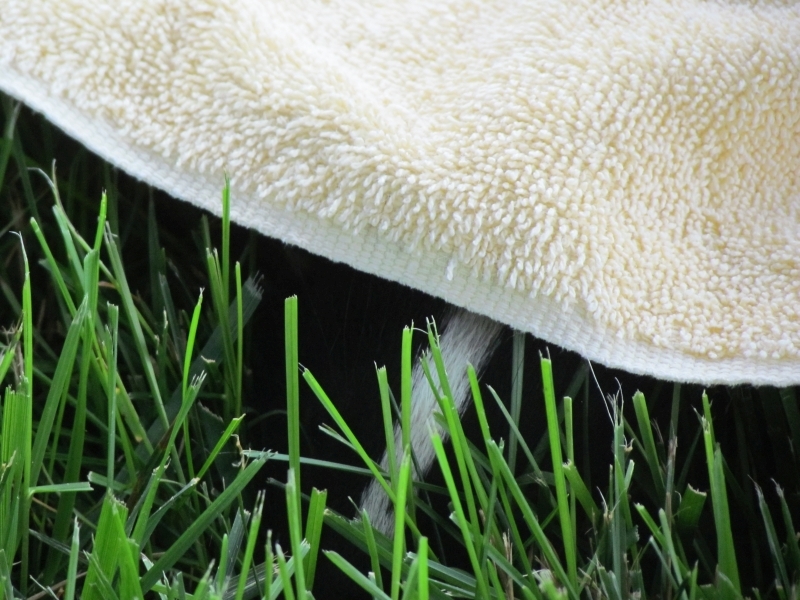 The last photo was Skunk’s head sticking out from under a towel thrown over it before it was picked up and placed in a box to go to the Center. 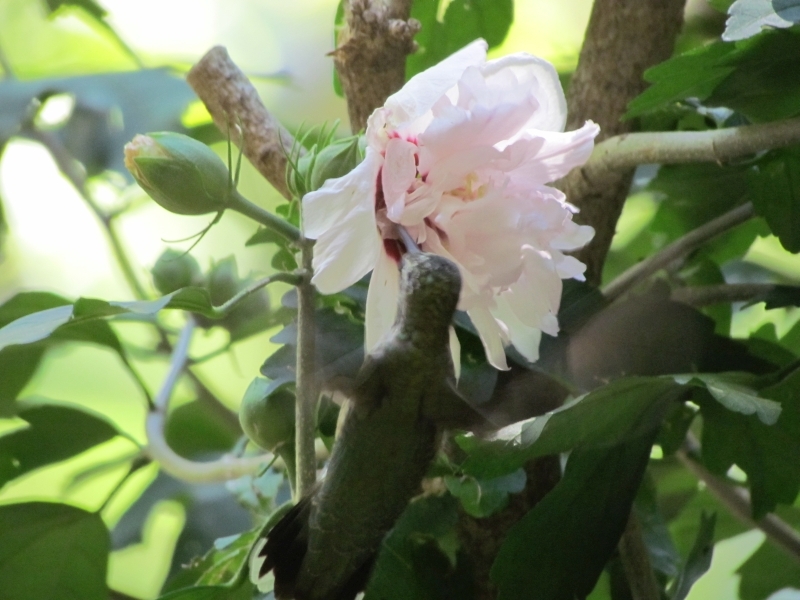 Here’s a Ruby-Throated Hummingbird sipping nectar out of the Rose of Sharon Bush by my front door this summer. Hummingbirds seem to like this bush and come by in warm weather for a taste. 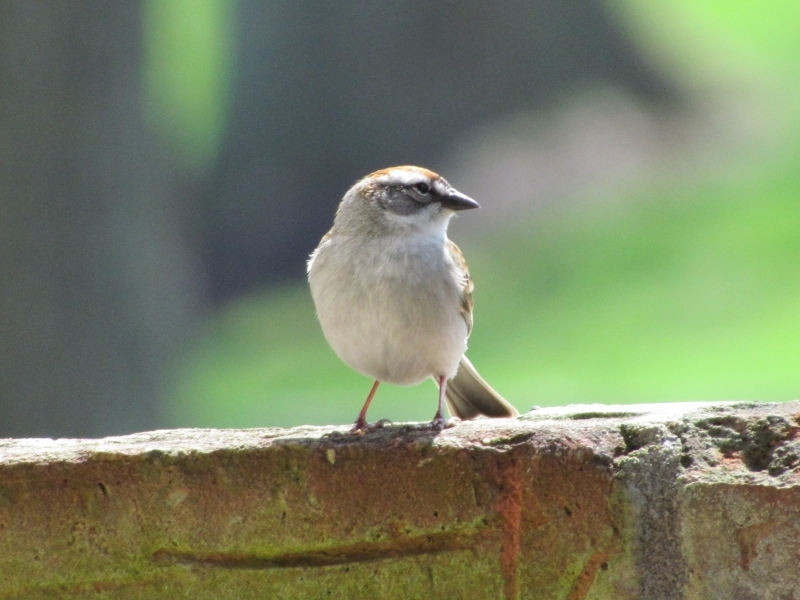 This gorgeous little bird is a Carolina Wren. Last winter was the first time I saw one on my patio, though I have heard and seen them in the nearby neighborhood on walks I’ve taken. They sing amazingly loud for such small birds. 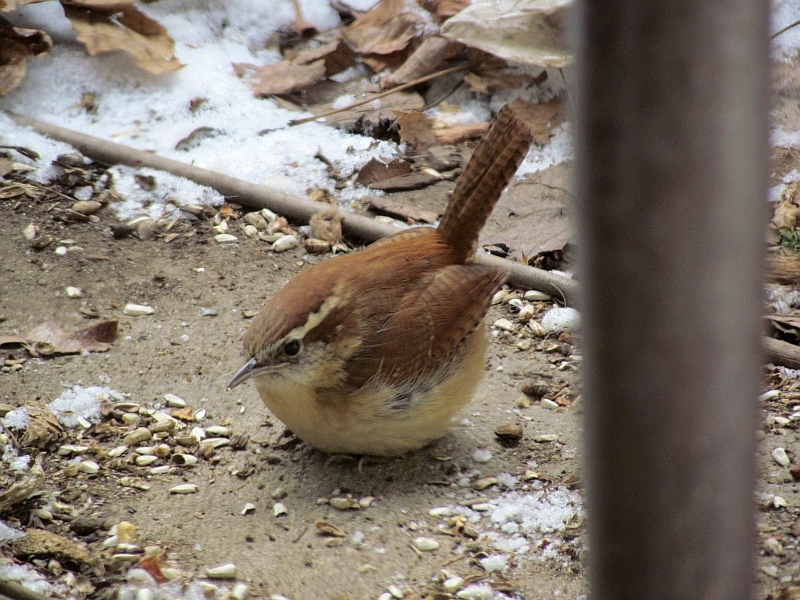 They are the only Wren that winters over in central Ohio, eating both insects and seeds. They take advantage of bird feeders. Back in the 1970s we had a terrible couple of winters that killed off most of these birds who wintered over, but now they are back in full force. 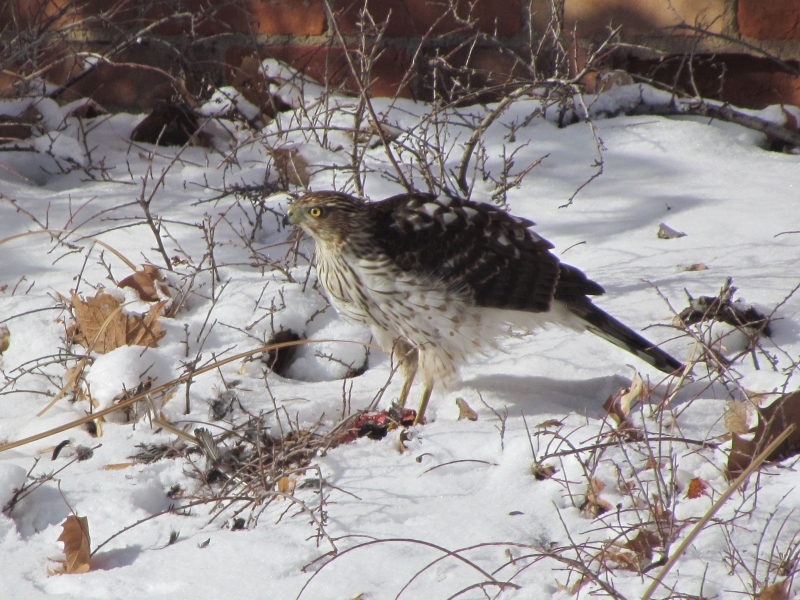 This one is quite possibly a young male looking for territory or adding my patio to its winter chow stops. It was fairly tame when it got used to me. Once the weather warmed up, I didn’t see it anymore- perhaps it will be back this winter. 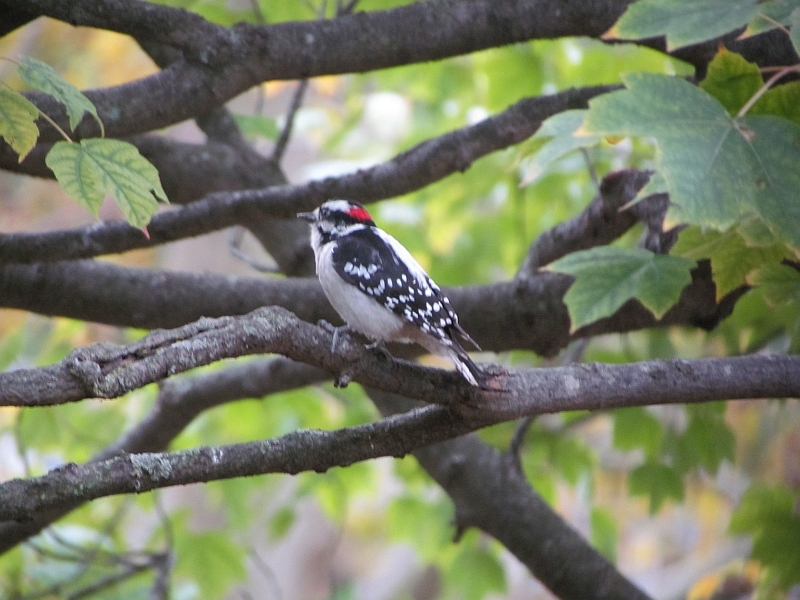 Here’s a male Downy Woodpecker that hangs out on the complex. I suspect he’s come down for a peanut occasionally, but I haven’t seen him do it yet. Speaking of Woodpeckers! 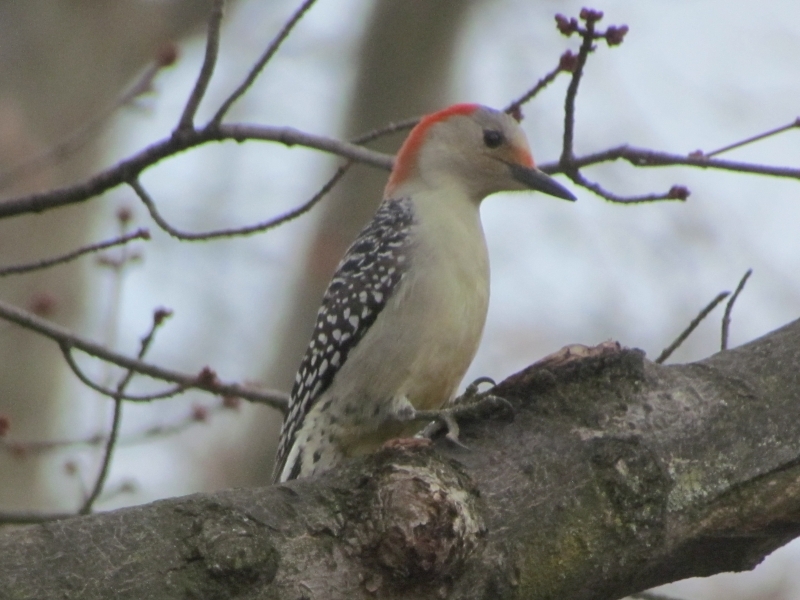 Here’s an exciting new occasional peanut eater, a Red-Bellied Woodpecker female. This is the first year I can remember having a regular Red-Belly on the complex. This bird is distinctive and fun to watch, and is fairly large. I hope she brings a mate along with her soon! 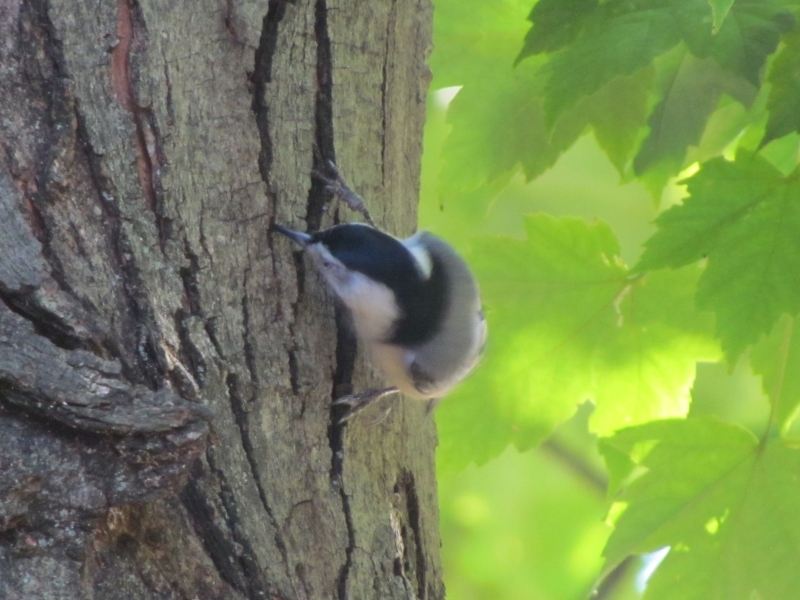 This is another brand-new bird on the complex, a White-Breasted Nuthatch who absolutely loves peanuts! This bird is tons of fun to watch, with its nasal ‘yank yank’ calls. It is somewhat like a Woodpecker, often feeding off of insects and their eggs found in tree bark, but it doesn’t really use its beak like a jackhammer like other Woodpeckers do. 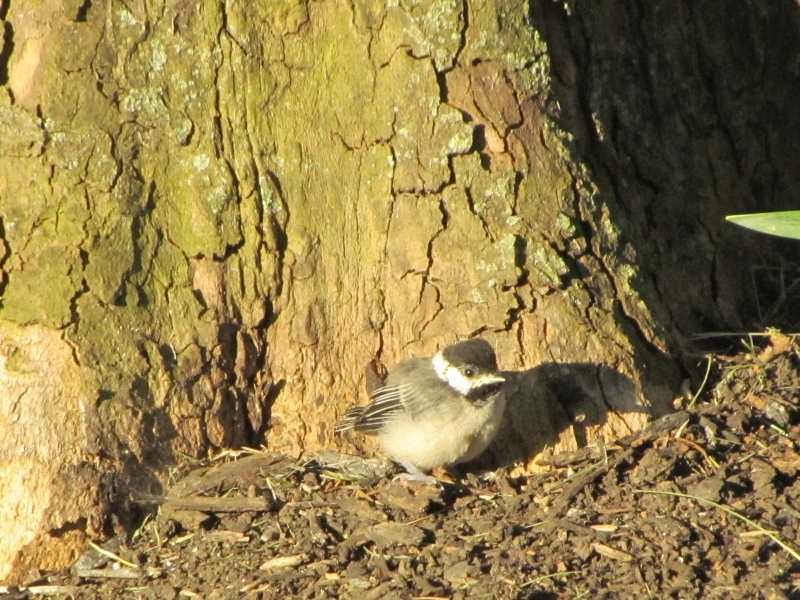 Here’s the Nuthatch wedging a peanut into tree bark to peck at it to eat. Very cool bird. I hope it too brings a mate along soon! Keep an eye out for critters around your place, you may be surprised at all of the activity going on around you. ← Ohio Trees – Sweet Gum. Wow! How wonderful! Thank you for your beautiful, interesting posts; much appreciated. What an interesting year of birds! Love the nuthatch and the woodpeckers especially. 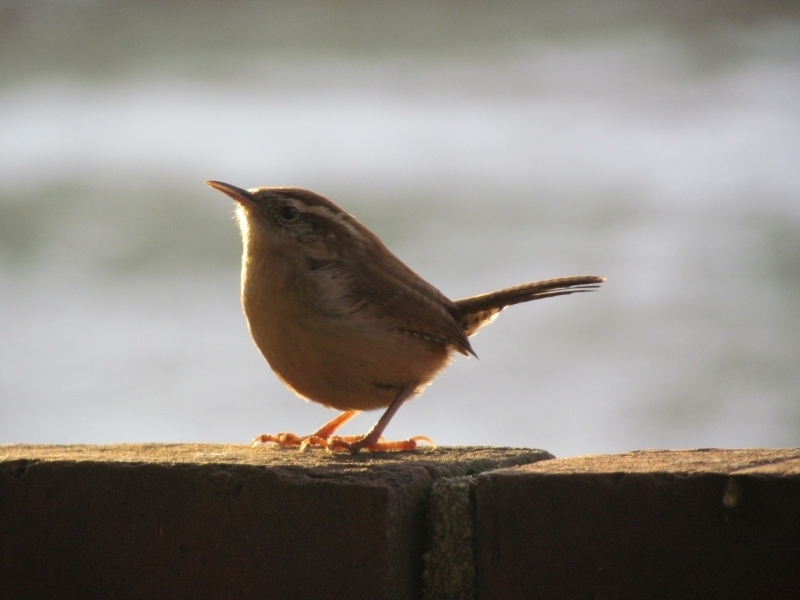 And the wren – so cute! These new visitors a a ton of fun, Jo! On a happier note, in Sept., Neco and I found an injured baby possum coming home from a dog run behind Graceland Shopping Center. After a night in the car carrier, it was obvious it wasn’t doing well, so we took it to Ohio Wildlife. Ohio Wildlife wasn’t optimistic (said broken jaw from car), but I signed a sheet saying I wanted to know its eventual outcome. Two weeks ago, I received an email from OWC, and heard that the possum had been “successfully rehabilitated” and returned to the wild. Yeah. Love your posts. Keep them up. Miss you at work. Thanks for visiting, I’ll have to stop in one of these days! Always love this round-up Tracy. Amazing what we can find outside our own back door. So true, John! Many thanks! Thank-you, and merry Christmas to you…. You have a splendid roster of visitors. Indeed, Tootlepedal- but your flock is amazing! Oh, I love this cast of characters! I enjoy many of the same visitors but without the personal interaction that you have described so beautifully! 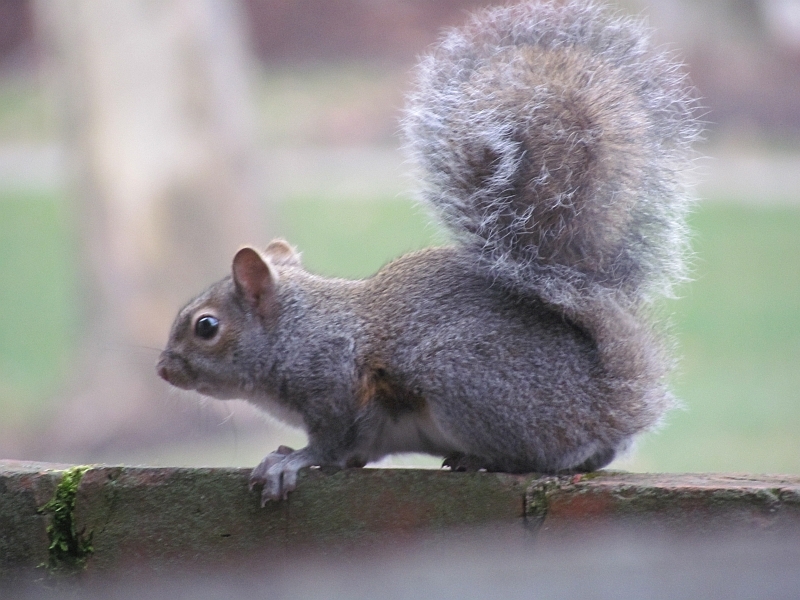 In our old house, we had “Squirrel Girl” – a sweet female squirrel who would jump up on the garbage can lid for her peanuts every time I went into the garden. Here the wildlife is truly wild and not very interactive. Except for the robin who tapped his beak on my front door when the birdbath was empty of water. Go figure. Truly nature at your door step! Indeed, Robert & Donna- Have a great holiday season! Beautiful collection! Guess I need to put our more than seed in feeders! I still remember the year we had a red bellied woodpecker for a spell. He’d hang from the bird feeder looking really silly since he was much too big for that! Wishing you a great holiday season! Many thanks and happy holidays, Inger!